Durham, NC, March 15, 2019 --(PR.com)-- In the midmarket space, IT teams often find themselves treading water just to stay afloat. In a new study released by Principled Technologies, engineers compared the storage performance, data reduction capabilities, and platform resiliency of a Dell EMC Unity 550F All-Flash array and the array of a competitor (“Vendor A”). This third-party evaluation can be useful for SMBs or departments that are operating storage stretched to its limits and looking for an option that will help them maximize storage capabilities. 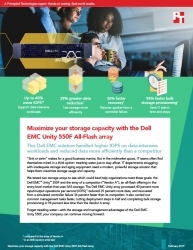 Forget treading water - check out the all-flash storage array comparison report, infographic, or video to learn how the Dell EMC Unity 550F can help businesses continue moving forward: http://facts.pt/1mmyay4, http://facts.pt/yz4c18y, and http://facts.pt/q8xhz9g.